At the start of the 20th century sculpture in Slovakia was still rather considered to be ‘Slovak sculpture’. The Secessionist style, relatively developed in the visual arts, was not at all reflected in sculptural works of art. 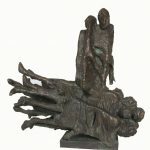 Historical and social themes were represented by the generation of older sculptors born before the 1900s, such as Alojz Rigele and Robert Kühmayer. Slovak national sculpture started to develop as late as after 1918. 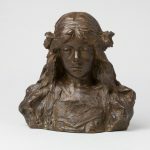 The Avant Garde movements of the early 20th century missed Slovak sculpture entirely. In a society with an undeveloped middle class, sculpture, as an art that always depended on sponsorship and commissions from the state, developed at a slower pace. The foundations of modern Slovak sculpture, in the spirit of actual European tendencies, were laid by Ján Koniarek (1878-1952). 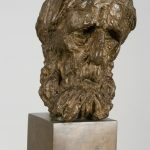 Through his works of art, August Rodin’s sculptural style is reflected in Slovakia, as opposed to the sculptural works of artists who followed the neo-classical work of the French sculptor Aristide Maillol, mostly represented by the monumental female pieces by Jozef Arpád Murmann from the 1920s. 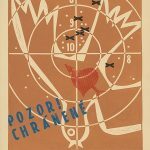 The change of the artistic environment in Slovakia was undoubtedly accelerated by the origin of visual arts schools. The Academy of Arts and Crafts was founded in 1928, and the contribution it made, together with the ‘monument fever’ that was naturally based on the endeavour to develop the cultural life of the nation, managed to considerably change the conditions for the development of Slovak art. Young Slovak artists graduating in Prague, Vienna and Budapest began to establish art traditions. One of the first Slovak sculptors to study at the Prague Academy of Art was Ladislav Majerský who brought Social Civilism to Slovakia. Social themes were also used in the works of Vojtech Ihriský, a student of Jan Štursa, and even in the early works of Rudolf Pribiš. In the 1920s and 1930s Július Bártffay used his direct experience as an assistant at the art studio of French artist Antoine Bourdell. 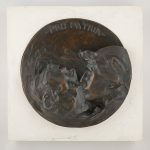 To the prejudice of dramatic pathos, Bártffay’s production at the peak of his career was paradoxically inclined towards Rodin’s Secessionist-symbolic aspects. At the end of the 1930s Jozef Kostka returned to Slovakia as one of the younger generation of artists. His work was already typical of the movement between realistic and abstract portrayals. For his sensual dimensional intuition and up to then unknown sculptural themes, he is referred to as the ‘poetic sculptor’. Rudolf Uher, another artist who co-founded Slovak sculpture in the 1940s, opened up the issue of archetype. Later, in the 1960s, he began to use a rustic-style character abstraction and generous sculptural gestures. At the end of the 1950s, the message of modern classic sculptors was referred to by Mikuláš Galanda’s Group, which looked for the material representation of the folk cultural heritage in Slovakia and for archetypical national memories in sculpture. This path in sculpture was followed by Vladimír Kompánek and Andrej Rudavský. In the 1960s, when censorship was relaxed by officialdom, sculpture began to deviate from realistic representations. 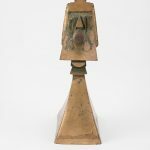 Structural abstraction and the non-sculptural handling of different materials opened the way for new methods of representation, not only in sculpture but also in all types of creative art. 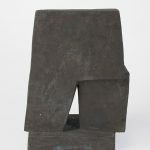 The sculptural protagonist of structural abstraction was Jaroslav Kočiš. The initial production of perhaps the most respected living Slovak sculptor, Jozef Jankovič, was also abstract. 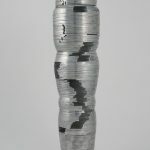 In his work he elaborated the issue of a found object and assemblage. Half way through the 1960s he began to use new types of form. The typical theme in his production is an intentionally overdesigned human figure or limb, brutally and almost sarcastically opposed to the ideal image of a human being and the human body in European sculpture. Also original was Jankovič’s production of monuments, the best-known of which was the monument to the Slovak National Uprising created for Banská Bystrica under the name ‘Victims Admonish’ (1965-69), which was later removed by the normalisation regime. Pop art and new forms affected the parallel production of Dušan Králik. 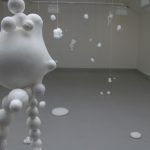 The most notable sculptors at the leading edge of plastic art inspired by natural shapes and constructive tendencies were Ján Mathé, Juraj Rusňák and Pavol Binder. Geometric-constructive production at the end of the 1960s was concentrated around the club of ‘concretists’, which included Štefan Belohradský and Juraj Bartusz. Later on, Juraj Bartusz combined plastic art with action and conceptual art. 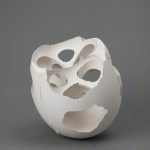 Mária Bartuszová also experienced a short period of geometric abstraction, after which she concentrated on her individual form of biomorphic sculpture as a result of an original method for processing liquid plaster. 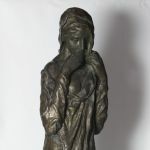 Also unique in the broader context was the work of Slovak sculptor Juraj Meliš, who gave up the dogma of academic teaching of classical modelling in favour of the anti-aesthetic programme of rough, unworked pieces. Creativeness in the selection of materials and techniques which was introduced by the second Avant Garde movement of the 1960s brought about the phenomenon of cancelling the borders between individual fields of art. 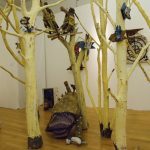 Using found objects, the sculptural ‘assembly’ of installations and the effects of conceptual thinking regarding production means that the nature of the artistic works of a whole line of sculptors active in Slovakia is intermediary. Perhaps the most typical intermediary artist is Vladimír Havrilla. Despite this, sculpture is important in the artistic thinking of Vladimír Havrilla; he draws, paints and even writes and assigns his sculptures through the telephone. He also started using computer animation for the execution of earlier spatial concepts. After 1989 the teaching structure at the Academy of Fine Arts and Design (VŠVU) in Bratislava naturally changed and Jozef Jankovič, Juraj Meliš and for a short time also Vladimír Havrilla, became the new leaders of the sculpture studio. 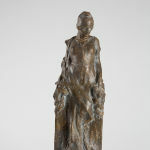 From the 1990s, emphasis was especially placed on mastering the materials and techniques of classical sculpture, combined with guidance towards new tendencies in three-dimensional works. 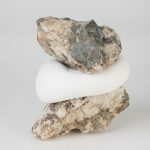 The work of the new generation of artists has thus moved towards experiments with untraditional sculptural materials, objects or installations. This trend is mainly represented today by Anton Čierny, Patrik Kovačovský, Denisa Lehocká and Michal Moravčík. 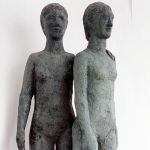 In 1998, with the help of Juraj Bartusz, the Department of Art at the Technical University in Košice was established as a new platform for teaching young sculptors.